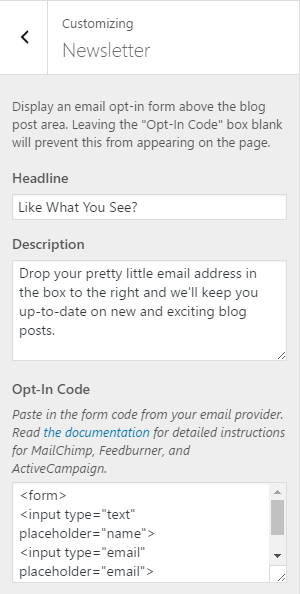 Elizabeth has settings in the Customizer for setting up a newsletter opt-in. In order for the newsletter banner to show up, the "Opt-In Code" box must be filled out. Otherwise the grey bar won't appear. Odds are, yours will have a lot more stuff in it, but you want to get it as close to that as possible. No <style> tags and so on. Copy the code from the "Copy/paste onto your site" box. However, you may want to make a few changes. Notice how I added a new parameter at the end for placeholder="Your email address"